MILWAUKEE—Officials called off a preseason game between the Milwaukee Bucks and Toronto Raptors because of concerns about the condition of the floor on Friday night.Officials stopped the game with 5:58 left in the first quarter after several players slipped on the court surface in the first few minutes of the game.After about 20 minutes’ worth of discussion, an announcement was made over the arena public address system that the game was not being played.It was the final preseason game for both teams.The Bucks were leading 14-9 when the game was stopped. Hawks fall to Lightning in extra time again, and were lucky to get that one point. TAMPA—Radko Gudas was able to joke after being center stage in what both coaches called a crazy ending.The Tampa Bay defenseman had a puck go off him late in the third and then assisted on Martin St. Louis’ goal 1:16 into overtime as the Lightning beat the Blackhawks 6-5 on Thursday night.Jonathan Toews was credited with a game-tying goal with 1:49 left in the third after the Lightning put the puck into their own net.Tampa Bay defenseman Matt Carle sent the puck from the neutral zone back into the Lightning defensive zone, where it went off Gudas and past a stunned goalie Ben Bishop into the net. Tampa Bay coach Jon Cooper said it seemed as if the goal took place in slow motion. “There’s been some crazy goals the last year and a half, and that’s one of them,” Joel Quenneville added. St. Louis got the game-winner from in-close, with Gudas getting his second assist of the season on the play. St. Louis, the Tampa Bay captain, also had an assist and moved past Neal Broten (923) for 93rd place on the career points list with 924.Bishop stopped 38 shots.Steven Stamkos scored a tiebreaking power-play goal as Tampa Bay (6-3-0) went up 5-4 at 17:31 of the third.Stamkos finished with two goals and two assists. Carle, Nate Thompson and Victor Hedman had the other Tampa Bay goals.The Lightning have beaten the defending Stanley Cup champion Blackhawks twice this season. Tampa Bay rallied from a 2-0, third-period deficit for a 3-2 shootout win in Chicago on Oct. 5. “You look at the game that we stole in Chicago … I don’t think we stole tonight’s,” Cooper said. The Blackhawks (6-1-3) also got goals from Bryan Bickell, Marian Hossa, Patrick Kane and Andrew Shaw. Kane assisted on Shaw’s goal, giving him five goals and 15 points in eight games against Tampa Bay.The Blackhawks took a 4-3 lead 93 seconds into the third on Shaw’s in-close power-play goal. It was the first time the Blackhawks have scored during the third period since opening night.Hedman’s first goal in 41 games tied it at 4 at 11:03 of the third.After blowing a two-goal lead, Stamkos gave Tampa Bay a 3-2 advantage at 17:21 of the second when he beat backup goalie Nikolai Khabibulin from the top of the right circle. It was just Khabibulin’s second start in Tampa since helping the Lightning win the 2004 Stanley Cup.Khabibulin made 19 saves. “He’ll be better going forward,” Quenneville said. Kane pulled the Blackhawks even at 3-3 on a breakaway goal with 1:07 remaining in the second.Bickell cut the Blackhawks’ deficit to 2-1 with a rebound goal with 11 minutes left in the second. The left wing has a goal in three consecutive games.The Hawks tied it at 2-all on Hossa’s thigh-high re-direction 1:36 after Bickell scored. Hossa has 438 goals, which ties him for 62nd place all-time with Gary Roberts.Tampa Bay took advantage of its first power play as Carle put the Lightning up 1-0 6:28 into the game. The Blackhawks entered with the NHL’s third-worst short-handed unit.Thompson stopped a 19-game goal drought to make it 2-0 during a short-handed 2-on-1 at 1:24 of the second. NOTES—There were a number of Hockey Hall of Famers with ties to the Blackhawks in attendance. Current Lightning broadcaster Phil Esposito spent time with former teammate Bobby Hull. Others at the game included Stan Mikita and current Blackhawks senior adviser Scotty Bowman. … Stamkos has nine goals and 14 points in seven games against the Blackhawks. … Hawk D Michael Kostka is expected to miss four to six weeks due to a lower-body injury. He was hurt during practice Tuesday. WICHITA—Derrick Rose shook off poor shooting early to hit clutch shots late and Carlos Boozer had 20 points and 13 rebounds to lead the Bulls to a 104-95 preseason victory over the Oklahoma City Thunder on Wednesday night. The Bulls (7-0) remained the only unbeaten team in the preseason behind Rose, who hit three 3-pointers in the final 4 minutes. He scored 26 points on 6-of-15 shooting in 34 minutes.Luol Deng had 20 points and 10 rebounds.Kevin Durant’s 22 points in 32 minutes and Jeremy Lamb added 19 points for the Thunder (3-3) while Reggie Jackson had 14 points.The Bulls outrebounded the Thunder 46-32 in the game played at Intrust Bank Arena.Rose followed two free throws with a pull-up 3-pointer to put the Bulls ahead for good, 89-85.The victory didn’t have coach Tom Thibodeau smiling. But even Thibodeau had to admit that the work of Rose and Deng to close out a game felt familiar. For most of the game, it appeared the Bulls were in control. Then Durant led a comeback.His 12-foot jumper with 5:16 remaining in the third quarter gave him eight points in the half and trimmed the Bulls lead to 64-62.A layup by Steven Adams with 9:46 to play put the Thunder ahead 78-76, Oklahoma City’s first lead since 9-8 with more than 7 minutes left in the first quarter. NOTES—The Thunder were missing Russell Westbrook, and Serge Ibaka did not play. Kirk Hinrich and Joakim Noah did not play for the Bulls. … The Thunder completed their preseason schedule and open the regular season Oct. 30 at Utah. The Bulls’ final preseason game is Friday against visiting Denver. … One of the biggest ovations came for Thunder rookie Rodney McGruder, who played at Kansas State. Former Kansas All-America Nick Collison was also greeted warmly and scored 12 points in 23 minutes. Chief Illiniwek Supporters and the U of I reach Understanding. CHAMPAIGN—Chief Illiniwek danced his official last dance at the University of Illinois on Feb. 21, 2007. But that hasn’t stopped U. of I. alumni and other fans from working to keep the controversial mascot around, leading U. of I. officials and chief supporters to clash from time to time. Now, U. of I. officials and organizers of the “Honor the Chief Society” have drafted an agreement that would end a trademark dispute and spell out specifically how the name and image can be used, according to a copy obtained by the Champaign News-Gazette.Roger Huddleston, co-founder of the Honor the Chief Society, said he expects the university to sign the agreement by the end of the week.The group filed an application with the U.S. Patent and Trademark Office in 2009 to register the Chief Illiniwek trademark, arguing that the university no longer had rights to it because it wasn’t using it. The university opposed the group’s application, and by signing the agreement, the group agrees to end that fight. Indeed, there is still a student who wears a headdress and makeup to dress up as the chief at athletic events. And several years ago, a person dressed as the chief performed the traditional dance at an unsanctioned event.The agreement states that the group can organize an event that includes the dance performance, though the university will not “approve, sponsor or endorse,” such an event. The 81-year tradition ended in 2007 after years of threats, lawsuits and NCAA sanctions against the university’s athletic teams. 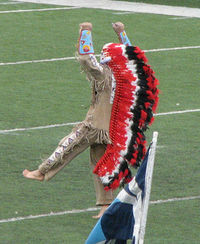 Chief opponents said that it was culturally insensitive to Native Americans, while supporters said it was an honorable tradition.The chief, a barefoot student dressed in a feather headdress and buckskin regalia, performed a three-minute dance during halftime at basketball, football and volleyball games. Hawks blow another two goal lead, but beat Florida in Shootout. SUNRISE—The Blackhawks won their first shootout of the season and showed signs that their scoring woes could be a thing of the past.Jonathan Toews and Patrick Sharp each scored in the shootout to lift the Blackhawks to a 3-2 victory against the Florida Panthers on Tuesday night.Toews also scored in regulation, Bryan Bickell added a goal and Corey Crawford made 20 saves.The Blackhawks haven’t scored in the third period since the season opener and lost two shootouts earlier this season. Sharp beat goalie Jacob Markstrom on the glove side for the deciding shootout goal. The Blackhawks have won five of their past six games and extended their point streak to six games.Florida has lost four of its past five games and has lost to the Hawks four consecutive times.Dmitry Kulikov and Tomas Fleischmann scored for the Panthers and Tim Thomas stopped 25 shots before leaving with 2:59 left in the game due to an apparent lower body injury. Markstrom entered the game and made two saves.Thomas was in his third start after missing four games due to a groin injury. After making a stop, Thomas bent to the ice in discomfort. When play stopped, he went to the bench.Trailing 2-0, the Panthers scored two goals in less than three minutes in the third. They closed to 2-1 on Fleischmann’s goal at 9:04. Aleksander Barkov passed across to Fleischmann in the lower right circle. His slap shot beat Crawford on the glove side.Kulikov took a shot from the high slot that got past Crawford at 11:51 that tied it at 2 and put the Panthers back in it and enabled them to salvage a point. Joel Quenneville is satisfied with the Blackhawks’ effort. The Blackhawks took a 1-0 lead on Toews’ power-play goal at 5:18 of the second. Duncan Keith made a nice pass from the top of the left circle to Toews skating in on the right side. His backhanded shot beat Thomas.The Blackhawks stretched their lead to 2-0 at 16:49 of the second. Bickell brought the puck to the left circle and wristed it past Thomas high into the net. Bickell’s goal was his second in two games.The Panthers were awarded a penalty shot at 9:24 of the second after Jonathan Huberdeau was tripped by Michal Handzus’ stick. Huberdeau couldn’t get the puck past Crawford, who made a pad save on his right side. NOTES—The Blackhawks haven’t scored a third-period goal since the season opener. … The Blackhawks took players’ mothers along on the two-game trip to Florida. They will play at Tampa Bay on Thursday. 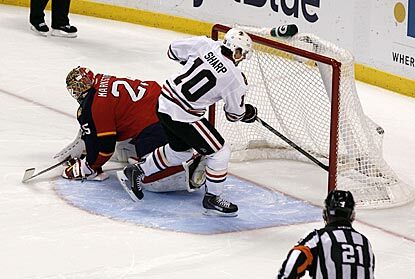 … Current Panthers Versteeg, Brian Campbell and Tomas Kopecky were part of the Hawks 2010 Stanley Cup championship team. … The teams faced each other for the first time since Jan. 20, 2012. Derrick Rose scored 24 points to keep the Bulls unbeaten in the preseason with a 105-84 victory over the winless Milwaukee Bucks on Monday night. The Bulls (6-0) quickly built a 20-4 edge over Milwaukee (0-5) midway through the first quarter, which eventually grew to a 30-point margin (84-54) in the third quarter.Carlos Boozer added 16 points and Luol Deng had 15 for the Bulls. Gary Neal scored 14 points and Brandon Kinght added 13 for the Bucks. LAKE FOREST—The Bears will be without two key players,QB JAY CUTLER and LB LANCE BRIGGS for a month–at least. The Bears confirmed Cutler has a muscle tear in his groin.HE will be out at least four weeks.Cutler suffered the injury in the second quarter of Sunday’s loss to the Redskins, after being sacked by defensive lineman Chris Baker.Cutler rolled over Baker as he was being tackled and stayed down.The quarterback was then replaced by back up Josh McCown, who played well, throwing for 204 yards and a touchdown while completing 14 of 20 passes. Jordan Palmer(Carson’s Brother)who was with the Bears in Pre-Season, has been re-signed. Briggs will miss 4-6 weeks with a shoulder injury,also suffered in Sunday’s loss to the Redskins.The report indicates surgery won’t be needed.The veteran linebacker injured his left shoulder while trying to shed a block in the third quarter on a routine play. Briggs did not return and was replaced by Blake Costanzo. Costanzo seems to be the likely replacement, but rookie Khaseem Greene could also fill in. Rookie linebacker Jon Bostic is already the starting middle linebacker, replacing the injured D.J. Williams.The Bears’ defense has already lost Williams, Henry Melton and Nate Collins for the season. The Bears have a Bye this weekend, but a week from tonight,they have a Monday game with Green Bay at Lambeau Field. Bears fall to 4-3 as defense(both teams)vanishes in 45-41 loss to Washington. Cutler,Briggs and others hurt. LANDOVER—The Bears and Washington Redskins moved the ball in the second half as if it were Arena Football, with Josh McCown shaking off two seasons of regular-season inactivity while trying to keep pace with Robert Griffin III.Both defenses were horrible! It was one of those games where the last team that scores comes away the winner. It turned out to be the Redskins, who got a third touchdown from Roy Helu with 45 second to play Sunday for a 45-41 win. Griffin completed 18 of 29 passes for 298 yards with two touchdowns and one interception for the Redskins (2-4), who have both of their wins against backup quarterbacks. This time is was McCown, who entered in the second quarter after Jay Cutler left with a groin injury. Griffin also ran 11 times for a season-high 84 yards against a Bears defense depleted by injuries, but the breakout performance came from rookie tight end Jordan Reed, who caught nine passes for 134 yards and one touchdown. McCown, playing in a regular season game for the first time since the 2011 season, completed 14 of 20 passes for 204 yards with one touchdown. Matt Forte rushed for three touchdowns, Alshon Jeffrey had 105 yards receiving, and Devin Hester tied Deion Sanders’ NFL record for return touchdowns with an 81-yard put runback for the Bears (4-3).The Redskins started their final drive with 3:57 to play and trailing by three. Milking the clock, they converted three third downs — including a 10-yard pass to Reed on third-and-4 inside the 20 — before Helu’s 3-yard run put Washington ahead for good. The Bears had taken a 41-38 lead on McCown’s 7-yard pass to Martellus Bennett, but that was only a sliver of a back-and-forth finish. Forte’s third touchdown — a 6-yard run up the middle — tied the score at 31 early in the fourth quarter, but the Redskins went back ahead less than two minutes later when Griffin threw deep to Aldrick Robinson, who snagged a 45-yard touchdown catch while defensive backs Charles Tillman and Chris Conte were tumbling to the turf. Then it was the Bears’ turn, although a couple of Redskins blitzes disrupted McCown enough to force a field goal instead of a touchdown. Robbie Gould’s 49-yard cut Washington’s lead to 38-34 with 8:39 to play. The Bears tried an onside kick and recovered the ball, but they were(questionably) ruled offsides and kicked deep on their second kickoff attempt. In the first half, Griffin, who threw only five interceptions last season when he was the NFL’s offensive rookie of the year, was picked off for the sixth time in 2013 when Tillman stepped in front of Leonard Hankerson and returned the ball to Washington’s 10-yard line. Forte scored two plays later to give the Bears a 10-3 lead. The Redskins tied it on Helu’s 14-yard run, giving the team just its second first-half offensive touchdown this season. Washington then took the lead when Jeffrey juggled a high pass from Cutler until the ball popped into the hands of linebacker Brian Orakpo, who returned his first career interception 29 yards for his first career touchdown. Cutler was injured when he was brought down early in the second quarter on the first career sack by 333-pound nose tackle Chris Baker. Cutler clutched at the top of his left leg and limped off the field. McCown looked understandably rusty in his first few plays, but Hester was there to restore some Bears momentum with his big punt return. It was his 19th career return touchdown and the third special teams touchdown allowed by the Redskins in three games.Reed’s 3-yard touchdown catch with 27 seconds remaining in the first half put the Redskins ahead 24-17, their first halftime lead of the season. The teams traded touchdowns in the third quarter, with Forte making a nice stutter-move on a 50-yard run, and Helu scoring from 3 yards out. In the log run, the Bears have more key injuries, and their season is more than ever in doubt as the Bye week begins. ND holds on 14-10 over USC after Rees leaves injured. SOUTH BEND—Tommy Rees threw two touchdowns before leaving the game with an injury and Notre Dame snapped a five-game home losing streak to USC with a 14-10 victory on Saturday night.Rees was 14 of 21 passing for 166 yards with TD throws to Troy Niklas and TJ Jones in the first half. Rees left the game when he was sacked by USC linebacker Lamar Dawson in the third quarter and didn’t return.USC managed just 121 total yards of offense in the second half. After converting both third-down conversions on their opening scoring drive, the Trojans went 0-of-11 the rest of the game.The Irish (5-2) beat the Trojans (4-3) for the third time in the past four games, after losing the previous eight straight, but won at home for the first time since Pete Carroll’s first year as USC coach in 2001. USC won last week in Ed Orgeron’s first game as interim coach following Lane Kiffin’s dismissal, but this is the earliest the Trojans have three losses since starting that 2001 season 2-5.In only the third night game at Notre Dame Stadium in the past two decades, there were mistakes and attrition by both teams.Marqise Lee, who sat out against Arizona with a sprained knee, had two catches for 18 yards in the first half but didn’t play in the second half. Silas Redd, the Penn State transfer who missed the first five games with a knee injury, got the bulk of the carries in the first half with leading rusher Tre Madden out with an injured hamstring, but had just two carries five yards in the third quarter. He finished with 19 carries for 112 yards.With Rees out, the Irish attempted just four more passes and none of them was close as the Irish could only 44 yards total offense in the second half.Cam McDaniel led the Irish rushing game with 92 yards on 18 carries. USC’s Cody Kessler was 20-of-34 passing with an interception, with Nelson Agholor catching six passes for 39 yards. USC also was hampered by 11 penalties for 95 yards and Andre Heidari missed field goals of 40 and 46 yards, leaving him 2-of-7 on field goals of 30 yards or more this season. Both teams squandered scoring opportunities in the first half. The USC defense was the first to come up big as safety Su’a Cravens was unblocked and tackled McDaniel for a 3-yard loss on fourth-and-goal from the 1-yard line. The Trojans responded with a 96-yard touchdown drive, with Redd rushing for 40 yards on six carries.The Irish tied the game on a 7-yard scoring pass from Rees to Niklas, his fifth touchdown catch of the season, tying him for second with Tyler Eifert in 2011 and Ken MacAfee in 1975 for scoring catches in a season by a tight end. The Trojans blew a chance to take a lead when Heidari missed a 40-yard attempt wide right early in the second quarter.Agholor returned a 47-yard punt by Notre Dame 48 yards to the Notre Dame 25, with another five yards added on because Notre Dame lined up in an illegal formation on the punt. But after Kessler threw an 11-yard pass to Lee, the Trojans had to settle for a 22-yard field goal.The Irish took the lead with a 91-yard drive on five plays, highlighted by two runs by McDaniel. On the first, he started right and cutback left for a 24-yard spinning run to the Notre Dame 41. After an incomplete pass, McDaniel cut left again for a career-long 36-yard run to the 11. Jones, who was shaken up two plays earlier, then caught an 11-yard TD pass to give the Irish their first halftime lead at home against USC since the ”Bush Push” game in 2005.Notre Dame running back Amir Carlisle, who played as a kick returner for the Trojans against Notre Dame two years ago, is believed to be just the second person to play on both sides of the rivalry. The other was Speedy Hart, who played for Notre Dame in the ”Green Jersey Game” in 1977 and for USC in 1980. Carlile finished with three carries for 12 yards.